Sunday, June 1, 2014 Since we arrived in Marokie we have had little downtime that is not about sweating, bathing or fending off eager children. Everything is wet. Everything stays wet. It rains everyday, it is always at 100% humidity and pushing 95º F and you sweat even when it is overcast. After we had set up our tents on our first night in the village we were fed a celebratory welcome dinner of fried chicken and french fries, then we quickly succumbed to our exhaustion and went to our tents. That night I laid on my blown-up, to-narrow air mattress and sweat. Soon I was slick where ever my skin had contact with anything; my legs sweat if they touched, my face sweat as I tried to get comfortable on my pillow and my back sweat causing me to slip around on my bed. My sleeping bag was tossed unceremoniously to a back corner of my tent. I did not sleep. I sweat and stared at the ceiling of my tent listening to the men walk through our little city of tents with flashlights. Someone turned on a radio at 4a.m, so that’s when I began to move around. Our first morning in the village (5/27) we had a late start. Tina, Andrew, Papanie and Cat had to make the customary visits to the surrounding villages to get the blessings from the chiefs to continue their work, and also to pay them a sum of money as a sign of good faith. Things are not motivated by good will here, the people are to poor. Things are motivated by money, and instant gratification. I am told by Cat that this is what happened after the war. People were to hungry and to poor to care about their culture anymore, so any customs that may have helped protect the forests prior to the war have been long forgotten by the villagers now. Things such as fallow periods for plots of land have dropped from 7-12 years to 2-3 years.This means less time for fruiting plants to grow back for the chimpanzees and other animals to feed on. While we waited Ryan, Ben, Nate, Brielle, Grace and I walked down the road towards Manoni, the other village involved in our project. The dirt road went through small plots of forest and large open fields, mostly filled with ground nut. As it was our first time seeing the area in the day light we were eager to spot some wildlife. 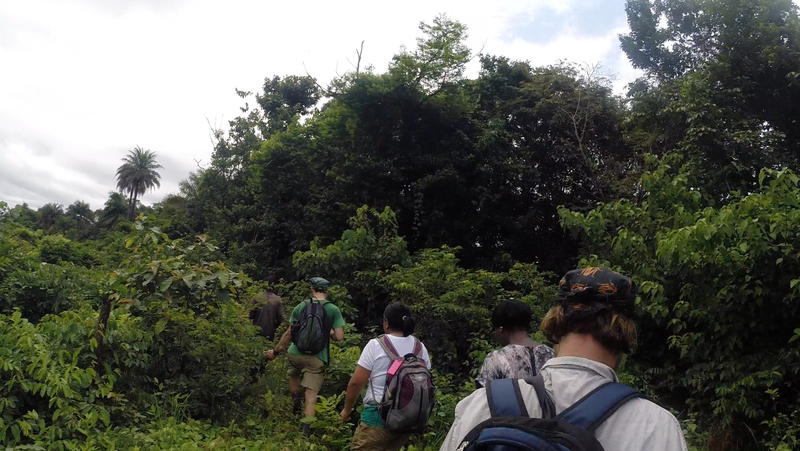 The first to see anything was Ryan, who spotted a green mamba in a tree along the path. I excitedly captured a variegated grasshopper, which I recognized from a favorite blog of mine WTF Evolution. I was thrilled to get up close to such a brightly colored little creature. After examining it’s spotted face I placed it gently on a leaf and went on my way. 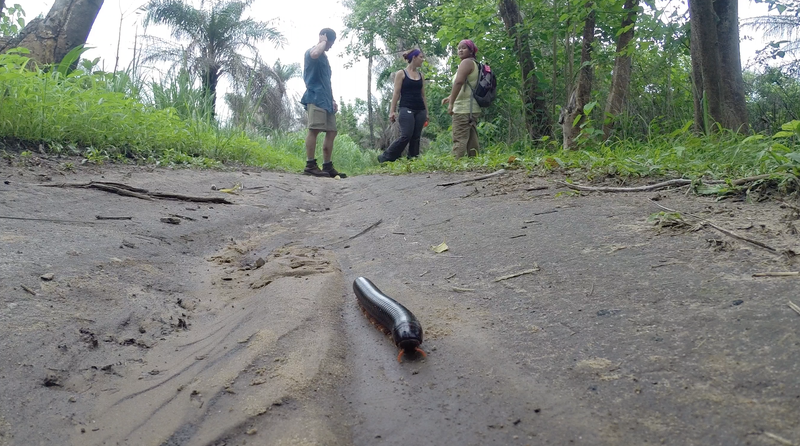 The dirt road was crawling (literally) with giant millipedes which were a sinister black and red color. Since we had no cell service or internet we were not sure if these were poisonous or venomous, so we chose to not touch them. A red colored insect with many legs in rural Africa? Just leave it be. But upon arriving home and researching any species I wasn’t sure of I found that these giant millipedes are commonly kept as pets and can be handled very safely, as long as you don’t go licking them. From the top of the hill we could see a misty mountain range in the distance. It was clearly visible because all of the forest in the way had been cleared for farmland. We decided not to visit Manoni on our own without any guides, so we turned around after getting our fill of the view. took us in a perfect circle, leading us right back to camp. His confidence never wavered. He would stop every so often, look in one direction, then the other, and simple know where he wanted to go. He picked us fruit and passed it out, “chimp eat this,” he would say excitedly before taking a bite. Two hours later I was covered in sweat (I know I keep repeating how sweaty I was, but it’s for emphasis. There was a lot of sweat), cuts and bites, but I was beaming. It was my first real bush experience and I was so relieved. I had been panicking that I would hate the forest and that my educational endeavors would have been worthless. My fears were for naught, I felt as though I had found my home. I would have not stopped smiling if it were not for all of the bugs flying in my teeth.